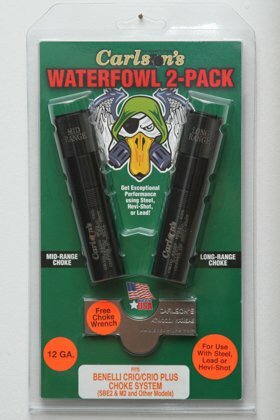 MID-RANGE, & LONG RANGE CHOKE TUBES Our Waterfowl Extended Choke Tubes are manufactured from 1704 stainless steel and designed to throw tighter and denser patterns than conventional choke tubes. These choke tubes feature a 25% longer parallel section in the choke, thus throwing more consistent patterns. Each choke tube is knurled on the end to allow for quick and easy removal. Each choke tube has the constriction and size laser marked on the end and body for easy reference.